I still have no idea why these women were marching except the weather was nice, they hate President Trump and are pro-abortion. The majority of women in the U.S. already marched on November 8th, 2016. We marched right to the voting booths and over 30 million voted for our President, Donald J. Trump. I watched the local news and still don't understand what they wanted. We have equal rights, we have respect from the President now, we make our own choices and the problem, I see, is that they don't like the consequences. I also watched the marches around the Nation and was horrified at the violence, the disgusting displays, the vulgarity and the the threats. Totally turned off. For those who couldn’t make it to Washington, D.C. for the Women’s March, South Bend hosted its own ‘sister march,’ along with more than 600 cities around the world. Just one day after President Trump’s inauguration, people in Michiana feel propelled to protest. “I think we need to make a statement,” said St. Joseph, Michigan resident Faye Chamberlain. South Bend Mayor Pete Buttigieg came out to the march to tell the crowd they’re definitely doing that. “What happened yesterday in Washington was important, but what’s happening right now in South Bend and across the country is extraordinary,” said Mayor Pete. 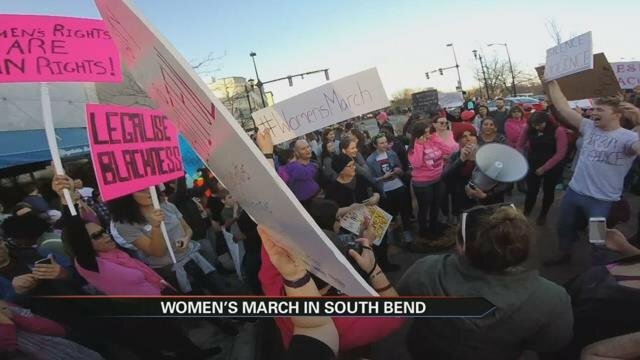 Thousands came out for South Bend’s sister march. “I really hope that it sends a message and that it sends a strong message at least to the White House,” said South Bend resident Olivia Critchlow. “Every person deserves equal rights, especially if they’re a human,” said John Adams High School student Perrin Fowler. “I believe very strongly that words do matter-- I think when people say it doesn’t matter, they’re not telling the truth, and we’ve heard a lot of things that are not true lately,” said Chamberlain. “I come from the age of the Cold War, and I thought that was over, but here it is again,” said one demonstrator, Russell Fages. Demonstrators say the main problem is intolerance. “I’m a mother, and I’m worried about my children’s future, so I’m out here for women’s rights, and black women’s rights,” said another demonstrator Danica Kulemeka. “I think that the march out here today says that there’s a big issue here, and that we’re all here to support the change and that it needs to change,” said Notre Dame student, Sara Berumen. They hope their representatives heed their call for change. “I hope that people who represent us, our senators and our representatives hear us and know that we won’t be silent,” said Chamberlain. They’ll continue speaking out as they march out of love for all people. “Love is love and hate is hate and love is stronger than hate,” said St. Joseph grade school student, Miriam Rios.